It’s Friday afternoon at the library. The doors to the Teen Center are shut and the lights are out, but it is not quiet. A sign posted on the door reads “Teen Gaming in Progress: Come In, We Are Open!” Those who enter are engulfed by the joyful screams and shouts of teenagers, eating Doritos and facing off in digital battle. 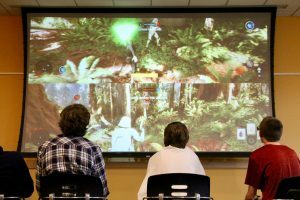 It’s Teen Gaming: a popular teen program offered every second and fourth Friday of the month. Being literate in today’s world means more than being able to read and write. Literacy means “knowing when and why you need information, where to find it, and how to evaluate, use, and communicate it in an ethical manner” (Senft, 2012). So, literacy might be more that reading and writing, but Doritos and Mario Kart? Really? Video games can play an important role in helping teens develop modern literacy skills, while simultaneously being highly engaging and rewarding (Sanford, 2008). Similar to reading a story, playing a video game immerses the gamer into another world with a fantastical set of rules. In order to navigate this new world, players need to put their research skills to use. They must seek new information, evaluate it for accuracy, and apply it to their current situation. Depending on the game, players may need to exercise skills including reading, creative thinking, problem solving, and decision making in order to progress in the game (Neiburger, 2007). Video games also encourage socialization between players, who may communicate and collaborate to achieve in-game goals. Youth interested in learning more about a specific video game may also seek out guide books, graphic novels, fan fiction (stories created by other fans), blogs, and videos to expand their knowledge. 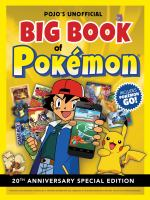 For example, those interested in the Pokemon series may consult guide books to improve their game. They may also be interested in reading stories or watching videos about the Pokemon universe. All of which are literacy activities (Senft, 2009)! If you stop by the Teen Center during Teen Gaming, you will certainly be greeted by the shouts of happy teenagers and the crunch of Doritos on the floor. But you will also see teens gathering in a safe space to socialize and practice their 21st century literacy skills. Neiburger, E. (2007). Games… in the Library?. School Library Journal, 53(7), 28-29. Sanford, K. (2008). Videogames in the Library? What Is the World Coming To? School Libraries Worldwide, 14(2), 83-88. Senft, A. (2012). Louder! – This is a Library! The Case for Video Game Programs in Public Libraries. Journal Of The Leadership & Management Section, 9(1), 9-13.